* Acknowledgements – This work would not have been possible without the help of my close friends David Davidian, Hagop Hachikian, George Leylegian and Khatchig Mouradian. Each has contributed, knowingly and unknowingly, to this study by their constructive feedback and material they have supplied me over the years. However, any errors or omissions are my own. ** Note – This study is based solely on available published material. I believe all information to be accurate, but field research would be required to resolve some of the lingering questions. The current, or most recent, Turkish names of villages are shown in brackets. The Dersim county [sandjak] encompassed the following districts [kaza] – Khozat (the central district), Charsandjak, Chmshgadzak, Kizilkilise, Mazgerd and Ovadjik. The ever-changing Ottoman administrative borders included the Dersim districts separately and collectively in various provinces throughout the 1800’s. During the waning years of the Ottoman Empire, the Armenian population was concentrated in the districts of Chmshgadzak and Charsandjak. The following table summarizes the population of Dersim over a nearly 30 year timeframe. The stagnation of the Armenian population during a period of substantial growth in the Muslim population is apparent. 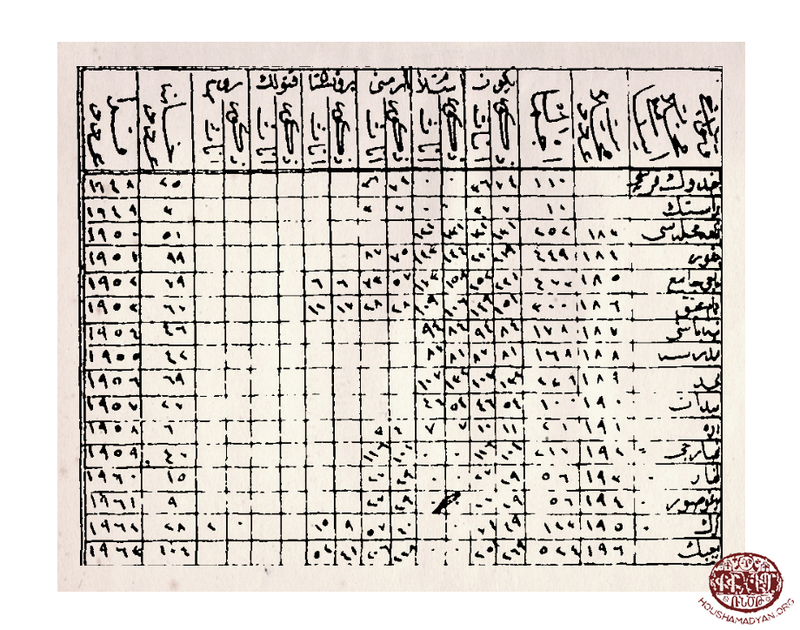 The 1894 yearbook calculated value represents the sum of the populations for individual villages from the 1312 Mamuretul Aziz salname (yearbook). The 1894 yearbook original value is the total population as printed in the same salname. The following is a general discussion about the population of each district and then of the specific villages within each district populated by Armenians prior to the genocide. One concept to take away from such an analysis is that both Armenian and Ottoman population data have deficiencies as well as strengths, used together they can compliment and supply a more complete narrative. Aggregate level data often masks limitations that only detailed analysis at the village level can expose. Prior to the Armenian Genocide, there were well over 100 villages in the district of Khozat. In the years since, this number has reduced dramatically. This is partly explained by small villages becoming hamlets as well as the boundaries of the district shifting throughout the years. The 1871 [1288 hidjra] yearbook [salname] for the Erzurum province [vilayet] seems to include Khozat within the Ovadjik district. The population of Ovadjik is given as 7050 males (6657 Muslim and 393 Christian) in 175 villages. Since Armenians were the only Christians in this area and there were no Armenians reported living in the Ovadjik district until 1914, it can be concluded that the 393 Christians were Armenian males in the Khozat district. The yearbook for the following year, 1872 [1289 hidjra], reported 6407 males (5991 Muslim and 416 Christian) in 177 villages. It also states there were six (Armenian) churches and three (Armenian) elementary schools. The exact same population numbers were stated in the 1873 yearbook [1290 hidjra] although the number of villages was reduced by one to 176. In addition, the total number of households was given as 2393. This equates to 2.7 males per household. The 1894 [1312 hidjra] yearbook for Mamuretul Aziz is unique in that it supplies the population of each village by gender and religion. This allows for an exact accounting of the villages included in each district as well as comparisons to Armenian sources. In addition, it is easier to reconcile tabulated populations, although the ability to discern errors is not completely removed. However, it is not known the exact dates when the data was collected. Presumably, it was collected between 1890 and 1893. Access to the population registers would be required to truly evaluate the quality of the data. Nonetheless, some interesting observations can be made. The yearbook indicates 17 villages with an Armenian population. In Armenian sources, some of these villages are included in other districts, primarily Chmshgadzak. The recorded population was 857 Armenians (502 males and 355 females) and 7530 Muslims (4703 males and 2827 females) in 1738 households. This equates to an average of 3.0 males and 4.8 total population per household. The population per household was higher in mixed villages and lowest in the two exclusively Armenian villages. Similarly, the recorded male to female ratio was highest in mixed villages and lowest in the two Armenian villages. The sample is small but indicative of an undercounting of women and possibly also Armenians males. Between these two data points of 416 (1872) and 502 (1893) Armenian males, Karekin Vartabed Srvantsdiants traveled throughout Armenia in 1878-79 and recorded the number of households in each village. Because only two of the seventeen villages (Brasdik and Haghtoug) were entirely Armenian, a direct comparison cannot be made. 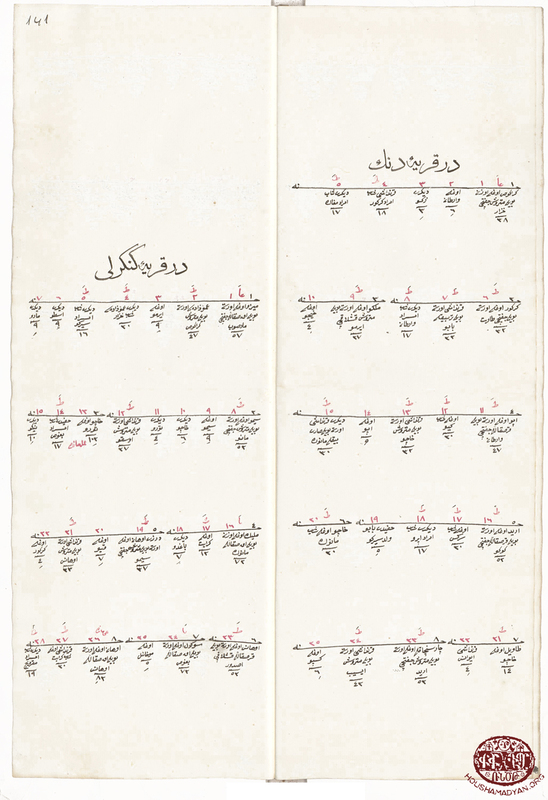 However, for these two villages, the household count in Srvantsdiants [Karekin Srvantsdiants, Toros Aghbar, Constantinople, 1884] matches the Mamuretul Aziz yearbook. Srvantsdiants’ total Armenian households for the 17 villages of the Khozat district was 171. 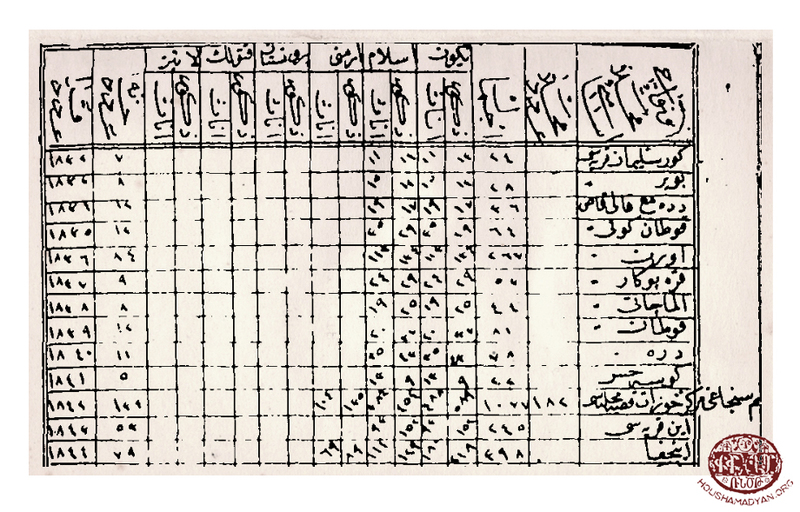 Population figures from the 1312 (1894) Mamuratul Aziz "salname"
The next available sources that identify Khozat distinctly are the Armenian Patriarchate data from 1913/14 and an Ottoman summary dated 1914. The Armenian Patriarchate census stated 1678 Armenians living in 281 households on the eve of the genocide in the 17 villages. The Ottoman document states an Armenian population of 1151. Neither source supplies any more detail. The difference between the two sources is, thus, 527 Armenians. It is well documented that the Ottoman population registers undercounted women and children. In addition, there is evidence that children were also undercounted in the Armenian Patriarchate census, although to a lesser degree than in the Ottoman data. From the Ottoman data, while the sample size is small, it is interesting to note that in the Khozat district the male to female ratio was much lower in villages with a mixed population than in purely Muslim or Armenian villages. Regardless, based on period commentaries, it might be expected that women would outnumber men in these villages due to two factors, men serving in the military and men traveling outside the district for work. For Armenians, the Hamidian massacres of 1894 to 1896 targeted mostly men and thus would be an additional cause for females outnumbering males. Even if one takes the conservative view that there would be an equal number of men and women, women would still be undercounted in the Ottoman records. We can not assume that the undercounting would be the same in 1914 as it was recorded in the 1894 Mamuretul Aziz yearbook or that the undercounting would be the same in Khozat as it would be for a larger geographic area for which we would have more recent data. 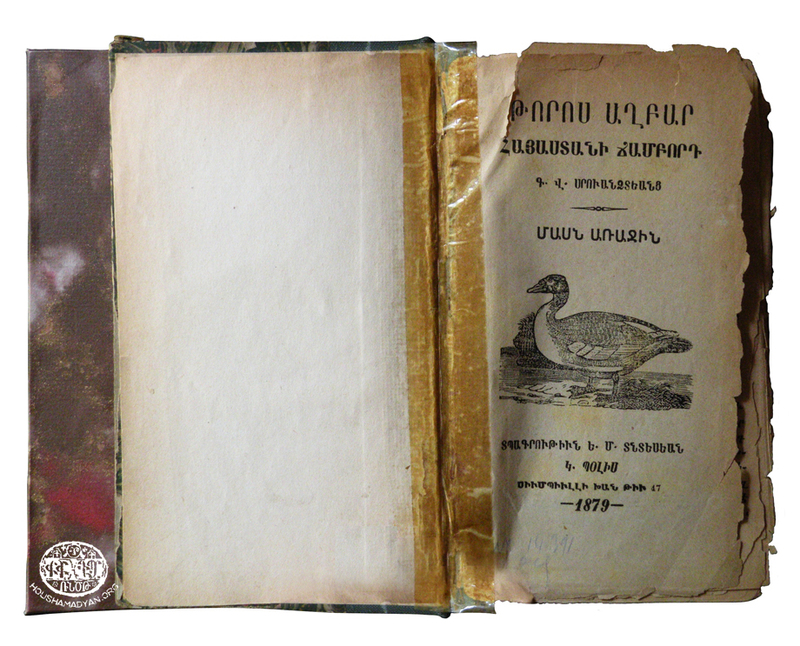 The male to female ratio for Armenians in the Khozat district was 1.41 in the 1894 Mamuretul Aziz yearbook. For the whole of the Dersim county, it was 1.16. The 1905/6 Ottoman census is known only for the Dersim county in its entirety and the male to female ratio for Armenians is calculated to be 1.18. While this is not entirely useful in arriving at an appropriate adjustment for the Armenian population in 1914 as recorded in Ottoman sources, it does confirm that women were undercounted and most likely to a similar degree throughout the period under study. Thus, it is not unreasonable to assume that a significant part of the difference between the two sources is due to the undercounting of women in the Ottoman records. Another issue with the 1914 Ottoman summary is that it was not actually based on an updated census. Instead, it was based on an adjustment to the 1905/6 census. The process of adjustment is not entirely clear, but an adjustment based solely on recorded births and deaths would most likely lead to further undercounting, particularly in an increasing population. One last point needs to be made before concluding. The recorded Muslim population of Khozat grew from 7530 to 11874 while the Armenian population grew from 857 to 1151. Thus, the Muslim population grew by 58% while the Armenian population grew by only 34%. Another way to phrase this is that the proportion of Armenians to the total population reduced from 10.2% to 8.8%. The Armenian population would have needed to be 1351 to maintain the same growth rate as the Muslim population. However, the 1894-96 Hamidian massacres and immigration were mitigating factors. In addition, there could have been better reporting of Muslim villages where the population was not given in the 1894 Mamuretul Aziz yearbook. Based on this analysis and that for other regions I have studied, the Armenian Patriarchate figures, while still conservative, are the best estimate for the Armenian population and are generally consistent with the Ottoman records after adjusting for known deficiencies. The following villages (new names are in brackets) had a recorded Armenian population prior to the genocide. I have not included population figures from the houshamadyan books. In regards to the population figures, often times the authors employ a simple factor to the household counts. Such methods leave much to be desired. The assumption for Armenians and Muslims often differed and the basis for the factor is left to the author’s own opinion. In addition, some sources simply make use of earlier published material, thus they are not necessarily updated information. While the information can be instructive, for this purpose I have chosen to exclude them. In addition, I have included the names of the churches although not all churches were necessarily functioning in 1915. 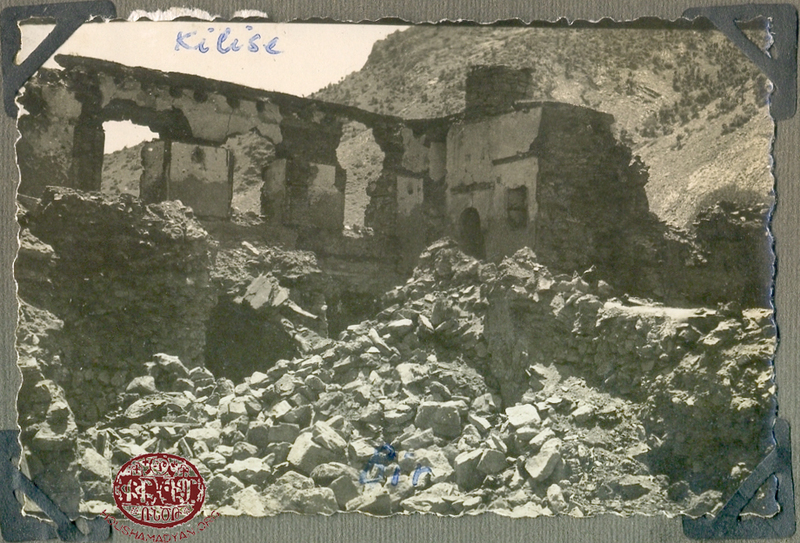 Period travelers mention the ruins of numerous Armenian churches and monasteries throughout Dersim. The Armenian population had been under duress and the movement from rural villages to the larger towns had been underway for many years. Karekin Srvantsdiants indicated the town had 19 Armenian households. The 1894 Mamuretul Aziz yearbook stated there were 239 Armenians (135 males and 104 females) and 838 Muslims (454 males and 384 females) living in 134 total households in Khozat. In 1914, the Armenian Patriarchate recorded the population had grown to 350 Armenians in 60 households. Karekin Srvantsdiants indicated the village had 7 Armenian households. The 1894 Mamuretul Aziz yearbook stated there were 21 Armenians (12 males and 9 females) and 112 Muslims (71 males and 41 females) living in 35 total households in Aghzounig. Around 1900, H. S. Eprigian [Soukias (Fr.) 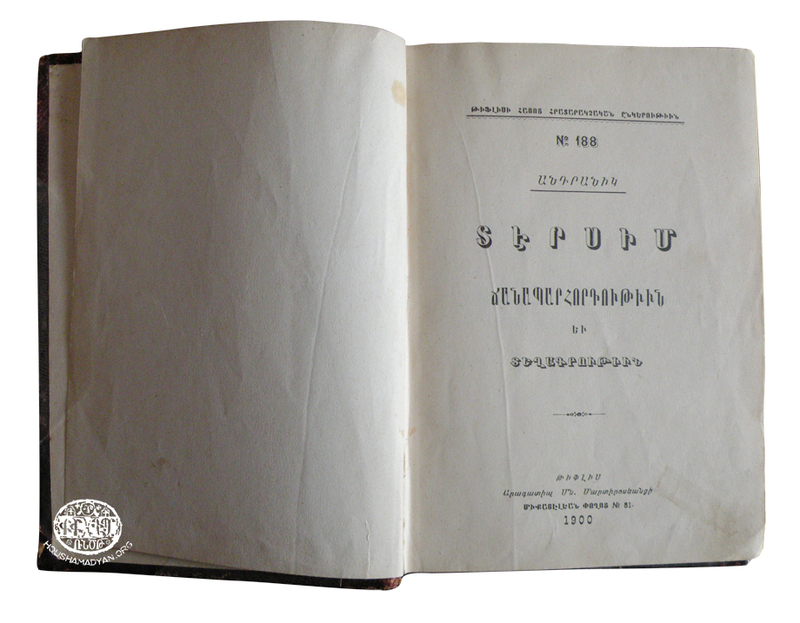 Eprigian, Illustrated Dictionary of the Historic Homeland (in Armenian), Vol. 2, Venice, 1907] stated 60 Armenians and 150 Kurds were living in the village. In 1914, the Armenian Patriarchate recorded the population had grown to 65 Armenians in 15 households. 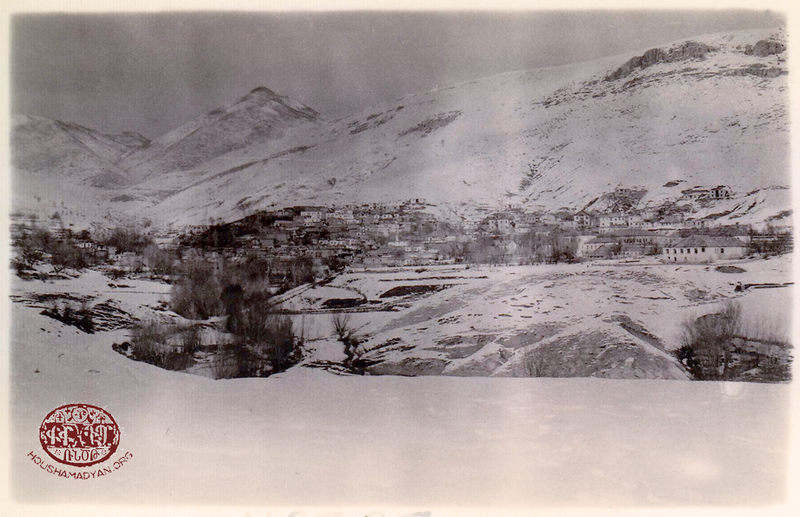 The village of Akrag was considered part of the Chmshgadzak district in Armenian sources, however in the 1894 Mamuretul Aziz yearbook it was included in the Khozat district. There were two villages with this name in the Chmshgadzak district. A map in Ghazarian [Haigazn Ghazarian, History of Chmshgadzak (in Armenian), Beirut 1971] identifies the wrong village as the one with an Armenian population. Karekin Srvantsdiants indicated the village had 9 Armenian households. 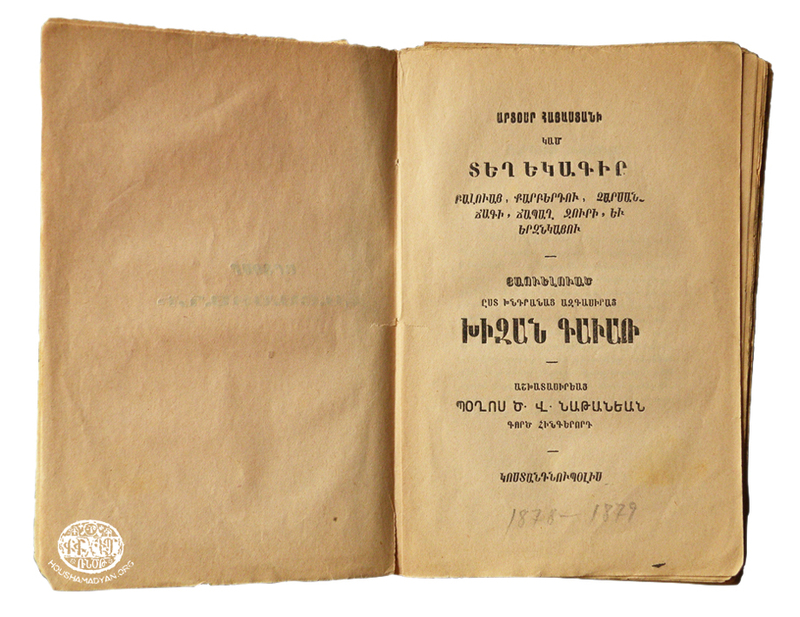 The 1894 Mamuretul Aziz yearbook stated there were 14 Armenians (7 males and 7 females) and 82 Muslims (46 males and 36 females) living in 14 total households in Akrag. The Diocese in Chmshgadzak recorded 26 Armenians in 5 households in 1902. It was noted that the Armenian population had greatly diminished as a result of a local Kurd seizing the church and monastery, using the stones to build his home. This Kurdish lord of the village, Diab Agha, was known to have rescued Armenians during the genocide. In 1914, the Armenian Patriarchate recorded the population had recovered to 42 Armenians in 7 households. In the years following the genocide, Hovhannes Adjemian [ ] compiled a list of Armenian families from the villages in the Chmshgadzak district and what had become of them (a copy of this material is stored at the National Association for Armenian Studies and Research). For the village of Akrag, Adjemian details 53 Armenians in 9 families. The village of Brasdik, also considered part of the Chmshgadzak district in Armenian sources, is now a hamlet of Haghtoug [Tekeli]. Karekin Srvantsdiants indicated the village had 3 Armenian households. The 1894 Mamuretul Aziz yearbook stated there were 10 Armenians (7 males and 3 females) and no Muslims living in 3 households in Brasdik. By 1902, the village was in ruins. Deke was another in the grouping of villages that were traditionally considered part of the Chmshgadzak district in Armenian sources (along with Brasdik, Haghtoug and Khadishar). Srvantsdiants indicated the village had 5 Armenian households. The 1894 Mamuretul Aziz yearbook stated there were 29 Armenians (17 males and 12 females) and 16 Muslims (10 males and 6 females) living in 11 households in Deke. The Diocese in Chmshgadzak recorded the population of Deke with village of Brekhi in 1902. In 1914, the Armenian Patriarchate recorded the population had grown to 42 Armenians in 11 households. For the village of Deke, Adjemian details 52 Armenians in 9 families. As already stated, Haghtoug was also part of the Chmshgadzak district in Armenian sources. Srvantsdiants indicated the village had 25 Armenian households. The 1894 Mamuretul Aziz yearbook stated there were 110 Armenians (74 males and 36 females) and no Muslims living in 25 households in Haghtoug. The Diocese in Chmshgadzak recorded 264 Armenians in 40 households in 1902. In 1914, the Armenian Patriarchate recorded the population had grown to 297 Armenians in 48 households. For the village of Haghtoug, Adjemian details 250 Armenians in 45 families. Karekin Srvantsdiants indicated the village had 7 Armenian households. At the same time, Boghos Natanian [Boghos (Rev) Natanian, Tears of Armenia, or a report about Palu, Kharpert (Harput), Charsandjak, Djabagh Chur and Erzindjan (in Armenian). Istanbul, 1883] indicated 78 Armenians in 5 households. The 1894 Mamuretul Aziz yearbook stated there were 31 Armenians (14 males and 17 females) and 140 Muslims (105 males and 35 females) living in 46 total households in Halvori. In 1914, the Armenian Patriarchate recorded the population as 32 Armenians in 5 households. The monastery was approximately 4 miles northeast of the village of Halvori. The 1894 Mamuretul Aziz yearbook stated there were 35 Armenians (22 males and 13 females) and 49 Muslims (31 males and 18 females) living in 16 total households in Halvorivank. 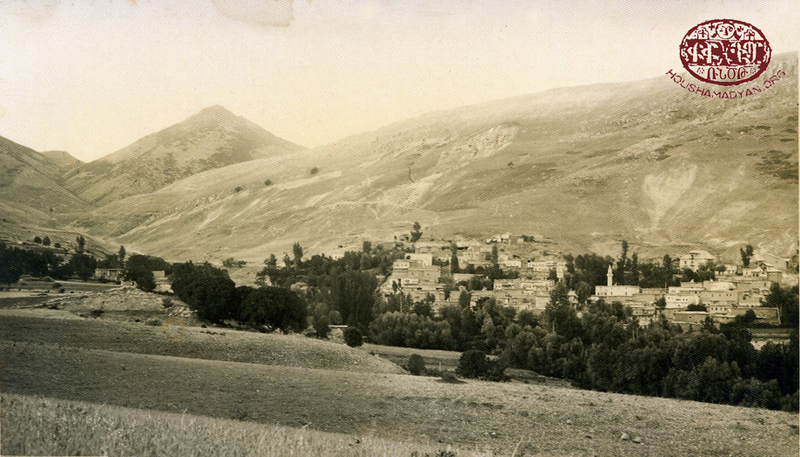 Early Armenian sources do not detail the monastery of Halvori as a separate village, but in 1914 the Armenian Patriarchate indicated there were 78 Armenians in 15 households around the monastery. From satellite imagery, it could be that the ruins of the monastery are approximately 200 meters north of the ruins of the village of Halvorivank (sometimes referred locally as Vank or Venk). As already stated, Khadisher was considered part of the Chmshgadzak district in Armenian sources. Some sources indicate Khadisher is now a hamlet of Kalejik [Kalecik] which is part of the Khozat district. Srvantsdiants indicated the village had only 3 Armenian households. Thereafter, no Armenian population was reported for the village. Karekin Srvantsdiants indicated the village had 12 Armenians households. The 1894 Mamuretul Aziz yearbook stated there were 23 Armenians (13 males and 10 females) and 19 Muslims (10 males and 9 females) living in 14 total households in Peyig. The calculated number of people per household (3.00) is unexpectedly low. In 1914, the Armenian Patriarchate recorded the population as 35 Armenians in 5 households. Karekin Srvantsdiants indicated the village had 8 Armenian households, but that there was no church. In these cases, it is likely that the church suffered decline in the 1800’s. The 1894 Mamuretul Aziz yearbook stated there were 33 Armenians (20 males and 13 females) and 42 Muslims (23 males and 19 females) living in 19 total households in Sigedig. In 1914, the Armenian Patriarchate recorded the population as 66 Armenians in 10 households. The village of Sin is today sometimes referenced as being the same as the village Desht [Geyiksuyu], but the villages were separate. Thus, the location of Sin is approximate based on satellite imagery and old maps. Karekin Srvantsdiants indicated the village had 7 Armenian households, but that there was no church. The 1894 Mamuretul Aziz yearbook stated there were 56 Armenians (39 males and 17 females) and 176 Muslims (116 males and 60 females) living in 19 total households in Sin. In this case the population per household is unreasonably large. In 1914, the Armenian Patriarchate recorded the population remained stable with 55 Armenians in 10 households. 1) Soukias (Fr.) Eprigian, Պատկերազարդ բնաշխարհիկ բառարան [Illustrated Dictionary of the Historic Homeland], Vol. 2, Venice, St Lazarus, 1907, 400pp. 2) Boghos (Fr.) Natanian, Տեղեկագրութիւն ընդհանուր վիճակին Սեբաստիոյ եւ անոր կուսակալութեան ներքեւ գտնուղ մէկ քանի գլխաւոր քաղաքաց [A Report on the General State of Sepasdia/Sivas and some of the Main Cities within its Prefecture], Constantinople, Hayasdanyats Press, 1877, 202pp. There were two villages named Sorpian with an Armenian population. Because they were both part of the Dersim county, it has created some confusion in the various sources (see #42 under Charsandjak). 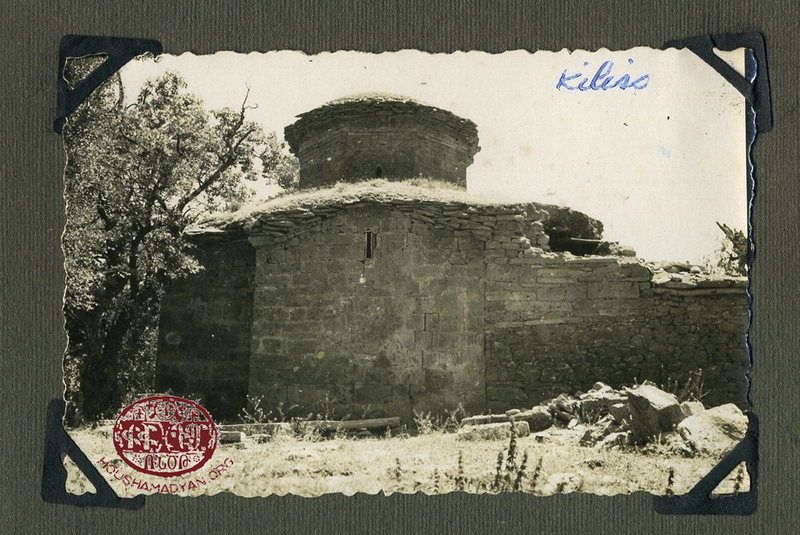 While Yenidoğdu is often given as the new name for the old village of Kilise, depending on the map the location is sometimes given as Sorpian. Regardless of which is the village today and which is considered a hamlet, they are within a mile of each other. The coordinates given are for the location of Sorpian. Interestingly, the village of Kilise was not shown to have had an Armenian population. It would seem likely that the village derived its name from one of the ruined monasteries that is reported to have been in the area. Karekin Srvantsdiants indicated Sorpian had 12 Armenian households, but indicated there was no church. The 1894 Mamuretul Aziz yearbook stated there were 40 Armenians (22 males and 18 females) and 57 Muslims (31 males and 26 females) living in 20 total households in Sorpian. In 1914, the Armenian Patriarchate recorded the population increasing to 130 Armenians in 20 households. The monastery of Sp. Tovmas is not mentioned in all sources. Thierry [Jean-Michel Thierry, Le Couvent Erkayn Enkuzik en Dersim, Revue des études arméniennes, vol. 20 (1986-1987), pp. 381-417] indicates the monastery of Sp. Tovmas of Tashdag is located in Geyiksuyu which was the village of Desht/Tashd, not Tashdag. Karekin Srvantsdiants indicated the village had 6 Armenian households. 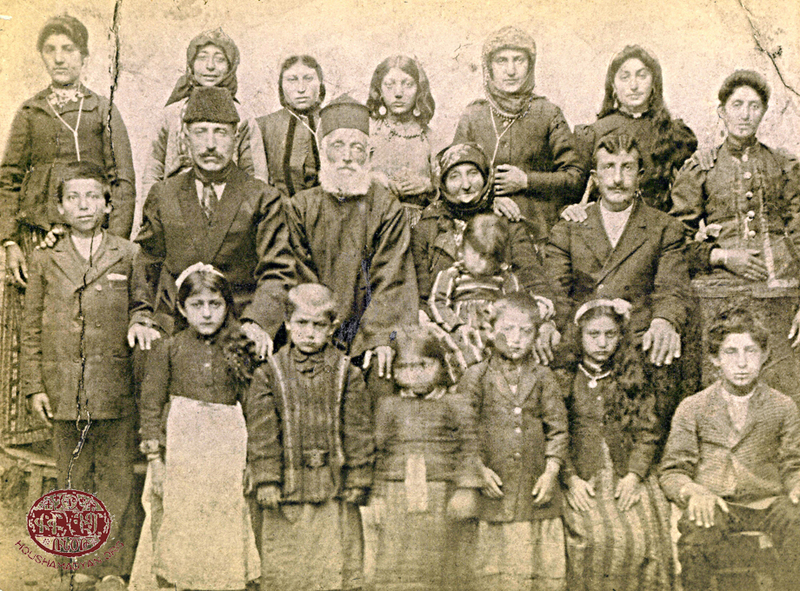 The 1894 Mamuretul Aziz yearbook stated there were 7 Armenians (4 males and 3 females) and 82 Muslims (53 males and 29 females) living in 19 total households in Tashdag. In 1914, the Armenian Patriarchate recorded the population increasing significantly to 135 Armenians in 20 households. Kévorkian supplies an alternate name of In for the village, however In was a different village located 1-2 miles north of Undjghag. It is also the only source for Garmir vank being located nearby, but most likely the monastery is a reference to that which is typically associated with the village Yergan which is where I have listed it. Karekin Srvantsdiants indicated the village had 28 Armenian households. Boghos Natanian indicated 140 Armenians in 20 households. The 1894 Mamuretul Aziz yearbook stated there were 158 Armenians (89 males and 69 females) and 240 Muslims (129 males and 111 females) living in 79 total households in Undjghag. H. S. Eprigian stated 28 Armenian households around 1900, though probably taken from Srvantsdiants. In 1914, the Armenian Patriarchate recorded an increased population of 240 Armenians in 40 households. The monastery is referenced under varied names. Current and historical pictures indicate a massive, almost cathedral-like, structure. Thierry has written a useful article regarding the monastery. Karekin Srvantsdiants indicated the village had 10 Armenian households around 1880. At the same time, Boghos Natanian indicated 35 Armenians in 5 households. The 1894 Mamuretul Aziz yearbook stated there were only 24 Armenians (12 males and 12 females) and 101 Muslims (62 males and 39 females) living in 25 total households in Yergan. H. S. Eprigian also states 10 Armenian households around 1900, again probably taken from Srvantsdiants. In 1914, the Armenian Patriarchate recorded the population remained stable with 30 Armenians in 5 households. Karekin Srvantsdiants indicates a village named Zampegh had 10 Armenians households and a church, Sp. Minas. Eprigian repeats this same information. At the same time, Boghos Natanian indicated 62 Armenians in 5 households for a village named Zmbegh. The 1894 Mamuretul Aziz yearbook stated 24 Armenians (14 males and 10 females) and 59 Muslims (36 males and 23 females) in 24 total households. The population per household is low. In 1914, the Armenian Patriarchate recorded the population for only one village of 81 Armenians in 10 households. Yerevanian indicates there were 10 Armenian households in Verin Zembegh and 15 Armenian households in Varin Zembegh. Haladjian states there were 16 Armenians households in Verin Zembegh and 22 in Varin Zembegh. When the population is only supplied for one village, it is unclear whether it represents the upper, lower or both. Teotig [Teotig, The Calvary of the Armenian Clergy and its Followers in 1915 (in Armenian), New York, 1985] lists the church as Sp. Toros while Kévorkian lists two churches named Sp. Kevork and Sp. Minas. Yerevanian and Haladjian state the church as Sp. Minas in Verin Zembegh. Safrastyan [ ] supplies states the name of the church for Zembegh as Sp. Kevork. The map in Ghazarian states the church for Zembegh as Sp. Minas. Without additional information, one could assume that Sp. Minas was the church for Zembegh Verin and Sp. Kevork was the church for Zembegh Varin. Boghos (Fr.) Natanian, Տեղեկագրութիւն ընդհանուր վիճակին Սեբաստիոյ եւ անոր կուսակալութեան ներքեւ գտնուղ մէկ քանի գլխաւոր քաղաքաց [A Report on the General State of Sepasdia/Sivas and some of the Main Cities within its Prefecture], Constantinople, Hayasdanyats Press, 1877, 202pp. Antranig, Տերսիմ. ճանապարհորդութիւն եւ տեղագրութիւն [Dersim: Travel and Topography], Tbilisi, Mnatsakan Mardirosiants Press, 1900. Başbakanlık Osmanlı Arşivi (BOA) Nüfus Defterleri (NFS.d. ), folder 2689, “1256 (1840) Harput eyaleti, (Maadin-i Hümayun) sancağı, Palu kazası, reaya defteri. a.g.y.tt”. Ghazarian, Haigazn, Պատմագիրք Չմշկածագի [Chmshgadzak History Book], Beirut, Hamazkayin Press, published by Chmshgadzak Compatriotic Union, 1971. Kevork Halladjian, Տերսիմի հայերի ազգագրութիւնը [Ethnography of Dersim Armenians], in “Armenian Ethnography and Folklore”, Vol. 5, Yerevan, 1973. Hampartsoum H. Kasbarian, Չմշկածագ եւ իր գիւղերը [Chmshgadzak and its Villages], Boston, Baykar Press, 1969. Justin McCarthy, Muslims and Minorities: The Population of Ottoman Anatolia and the End of the Empire, New York, New York University Press, 1983. Naci Okcu and Hasan Akdağ, Salname-i vilayet-i Erzurum (1287/1870-1288/1871-1289/1872-1290/1873): Erzurum il yıllığı, Erzurum 2010. Dikran Papazian, Պատմութիւն Բալահովիտի [History of the Valley of Palu], Meshag Press, Beirut, 1963. Antranig L. Poladian, Պատմութիւն հայոց Արաբկիրի [History of the Armenians of Arapgir], New York, Baykar Press, published by the Arapgir Association of America, 1969. Safrastyan, A. Kh. Gosdantnoubolsi Hayots Badriarkarani Goghmits Tourkiayi Artaratadoutyan yev Tavanankneri Minisdroutyan Nergayatsvadz Haygagan Yegeghetsineri yev Vankeri Tsoutsagnern ou Takrirneru in Echmiadzin, Feb – Apr 1965. Pp. 184-187. Jean-Michel Thierry, Le Couvent Erkayn Enkuzik en Dersim, Revue des études arméniennes, vol. 20 (1986-1987), pp. 381-417. Kevork S. Yerevanian, Պատմութիւն Չարսանճագի հայոց [History of Charsandjak Armenians], Beirut, G. Donigian Printers, published by Pan-Charsandjak Union Central Board (Fresno), 1956. İbrahim Yılmazçelik, XIX. Yüzyılın İkinci Yarısında Dersim Sancağı, Elaziğ 1999.